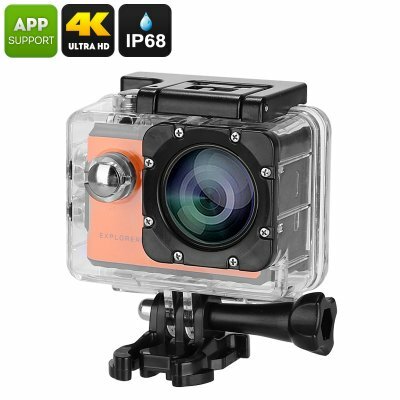 Successfully Added Explorer 2C Action Camera - Novatek Chipset, Sony Sensor, Wide Angle Lens, 4K Recording, 2 Inch Touch Screen (Orange) to your Shopping Cart. The MGCOOL Explorer 2C is an affordable sports action camera that treats you to stunning footage and images. Thanks to its Sony IMX078 sensor and the Novatek 96660 chipset, this 4K action camera is capable of producing Ultra-HD 4K footage and crisp 20MP pictures. The camera furthermore comes equipped with a 7G lens that enhances the light input to make sure you’ll always end up with sharp images no matter the weather conditions. Additionally, you’ll be treated to a 170-degree wide angle lens that lets you conveniently capture all that lies ahead. This 4K action camera features an extremely compact and lightweight design. Thanks to this, you’ll be able to easily attach it to your equipment and carry it along anywhere you go. It furthermore features a simple design that includes one power button and a single recording button. The 2.0-Inch touch screen display offers you all the convenience needed for navigating through all the features this 4K action camera has to offer. By treating you to an abundance of shooting modes and recording functions, this 4K sports camera is sure to meet your personal recording style. It comes with anti-shake, adjustable exposure, white balance, adjustable recording angles, and a dedicated diving mode. All these features and more allow you to easily set up your camera in such a way that you’ll always end up with the perfect end-result. Your 4K action camera furthermore supports WiFi connectivity for easy file-sharing and comes with a 1050mAh battery that puts forth a respectable usage time. The MGCOOL Explorer 2C Action Camera comes with a 12 months warranty, brought to you by the leader in electronic devices as well as wholesale 4K Sports Cameras.